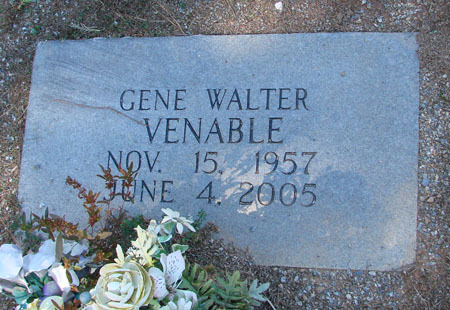 Gene Walter Venable, 47, of Woodstock died Saturday, June 04,2005. Services will be 3 p.m. Monday at Sosebee Funeral Home in Canton, with the Rev. Clent Boling officiating. Burial will be in the Old Macedonia Cemetery. Survivors include his daughter, Emma Ray Venable of Ballground; two brothers, David Pressley of Louisville, Kentucky and Willis L. Venable of California; and four sisters, Connie Kincaid of Woodstock, Mary Whitehead and Shirley McGarity, both of Canton, and Stella Clanton of Alpharetta.